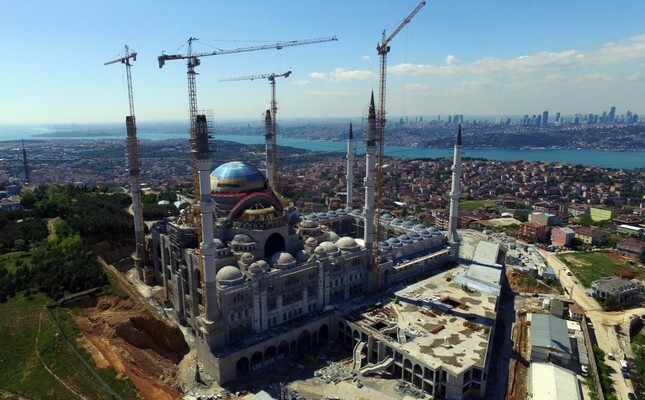 The Çamlıca Mosque, the largest mosque yet constructed in the Republic of Turkey, will allow congregants to pray in the courtyard during a special Ramadan program, marking the completion of external construction.The mosque will be open on July 1 for the special prayers made for Laylat al-Qadr (Night of Power), traditionally considered the 27th night of Ramadan, marking the revelation of the Quran to the Prophet Muhammad (Peace Be Upon Him). The rough work for the mosque's exterior is nearly complete, and the courtyard is being prepared for the Ramadan program. Around 10,000 visitors are expected to attend the event, which will start with a street iftar (fast-breaking meal) in the district of Üsküdar in Istanbul and continue inside the mosque, where Laylat al-Qadr will be commemorated with prayers. The Çamlıca Mosque was designed by two female architects, Bahar Mızrak and Hayriye Gül Totu, with a budget of roughly TL 150 million ($66.5 million). Constructed on 30,000 square meter area, the female-friendly mosque features special accommodations for the disabled, a platform where visitors can observe prayers, an Islamic art gallery and museum, as well as a library. The mosque's construction began in August 2013.